Gatti Plumbing is proud to be the go-to plumber for homeowners and businesses in Rochester. We work hard to earn our reputation by providing the best customer care and most complete plumbing services available. At Gatti Plumbing, we believe in delivering superior service from the moment you first contact us. Our plumbers enjoy their work, and it shows! Our service philosophy means that our courteous plumbing professionals will arrive on time, assess the work needed and clearly explain it, along with any options. Gatti Plumbing technicians are focused on prompt repairs and smooth installations–done right the first time. We respect your time and your home and we stand behind our work. Our goal is to earn your business for life. Paul Gatti had been working for a Rochester-area plumber for five years when he decided it was time to make a change. Wanting to be his own boss, he established Gatti Plumbing Inc. in 1977. 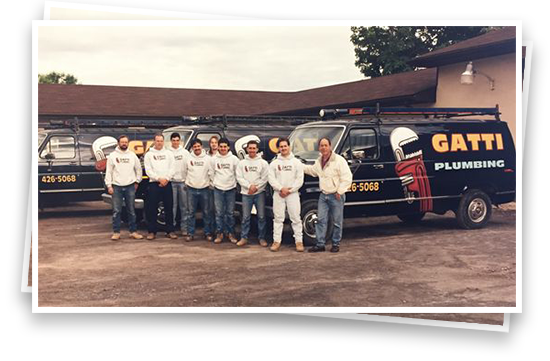 Starting out as a one-man operation based at the family residence in Greece, Gatti Plumbing initially focused on new home construction, catering to the local housing boom of the late 1970s and early 1980s. Some of the siblings first delved into other ventures after graduation, but one by one, each of them found themselves at Gatti Plumbing. Jon joined full-time in 1990. Jon became the company's vice-president by 1996. Celebrating our 40th year serving in business! As our customer base grows, Gatti Plumbing is growing right along side of them. Gatti Plumbing is excited to announce that we are expanding our headquarters again to better serve our customers needs. We look forward to a larger, more efficient facility geared towards servicing our customer faster and with greater capabilities. At Gatti Plumbing, our dedication to customer service and our experienced, well-trained plumbers set us apart from the average drain cleaning and plumbing service. We’ll get to your home quickly in an emergency, anytime 24/7. For regularly scheduled maintenance installations and other routine appointments, we’ll work at a time that’s convenient for you. That’s why our distinctive service vans are seen so often in neighborhoods across Rochester… Just look for the red wrench!